There is a small series of bottles carved from solid blocks of emerald-green glass which imitate jadeite. As a general rule, they are of this simple, compressed ovoid form, and devoid of decoration. Records from the Imperial archives testify that glass intended to imitate jadeite was produced from as early as 1743. There are also numerous examples of plume holders for hat feathers of officials made from similar glass. This is one of the most impressive of all known bottles of the group, with its realistic weight and excellent imitation of the real stone. 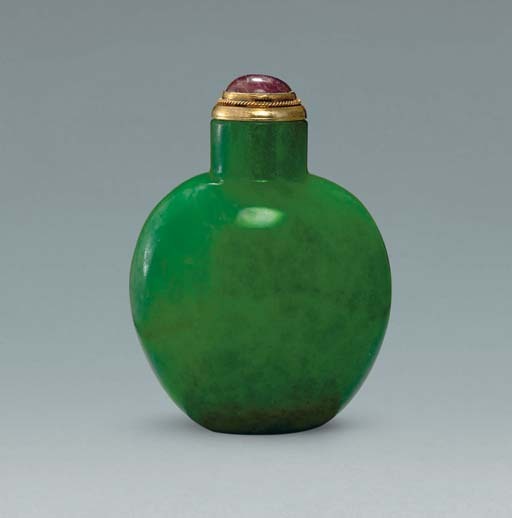 For other examples of glass bottles imitating jadeite, see one with mask-and-ring handles, in the Bloch Collection, illustrated by Moss, Graham, Tsang, A Treasury of Chinese Snuff Bottles, Vol. 5, Glass, no. 976, where other examples are also cited.